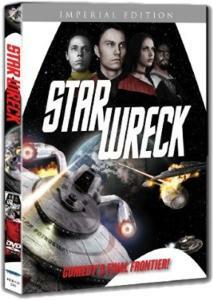 Star Wreck is a 105 minute long Star Trek spoof made by some Finnish fans. Don’t worry: it isn’t anywhere as bad as it sounds . . .
Actually Star Wreck is one of those movies which you appreciate more the more you learn about how it was actually made. It shows you what can be accomplished with the right amount of cultish dedication and clever ingenuity. The movie took about seven years to complete. For an amateur film it boasts some impressive major movie special effects. Surprisingly the CGI effects were rendered using standard home computers. IMDb.com tells that “in some scenes a single frame could take over ten hours to render and in one second of footage there are 25 frames. Overall, the CGI seen in the movie took five years to render.” Scary. Star fleet captain James B. Pirk (Samuli Torssonen), Commander Info (Antti Satama) and Plingon Commander Dwarf (Timo Vuorensola) are stuck in early 21st century Finland for some reason. When the timeline doesn’t pan out the way the way they expected it to, they take matters into their own hands and supply the Russians with some future technology to conquer the planet. Pirk becomes Emperor of Earth in the process. 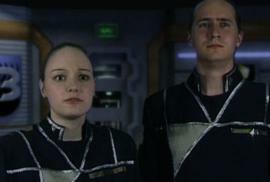 Then one day their new star fleet encounters an alien ship and then they discover a new universe in which . . . But we wouldn’t want to give away too much here. Star Wreck works best when it pokes fun at sci-fi TV show conventions and clichés. Fans will have a blast. There are creative missteps though: some attempts at slapstick comedy fall embarrassingly flat and the acting is a bit rough around the edges. WORTH IT? Trek and Babylon 5 fans with a sense of humor will appreciate Star Wreck the most. If you’re willing to forgive the movie’s faults then you’re in for a good time.